As low as $18 for 9 Feather Hair Extensions from NuMe + FREE Shipping! Regularly $60! Head on over to Mamasource to get 9 NuMe feather hair extensions for only $20 plus free shipping. This is a $60 value! To sweeten the deal, if this is your first Mamasource purchase, use the code DEC10 at checkout to make it just $18! 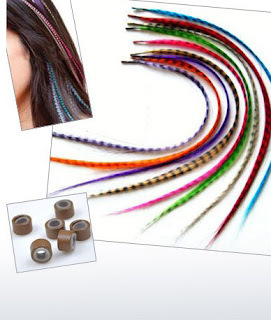 You'll get 3 sets of extensions in up to 3 colors: red, green, blue, yellow, pink, purple and silver. Get your feathery fix with NuMe's colorful variety of faux-rooster hair extensions. These fun features are crafted from real human hair, allowing routine heat styling with any one of our high quality ceramic irons, curling wands or the ionic dryer. Our feather extensions are synthetically made, therefore 100% cruelty free. No fowl play here.